To book your next event contact Marcy by email or text her at 608-772-6777 or call 1-888-324-0442 for open dates and presentation options. Be sure to leave the date of your event, if known, with any messages. 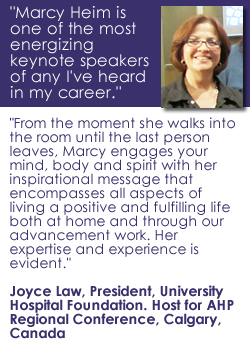 Marcy personally arranges all her speaking. 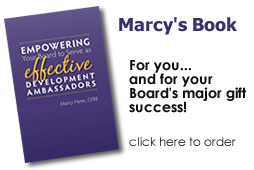 Human Options Board – Engagement and Fundraising are Team Sports! 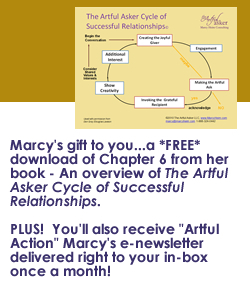 Marcy will be in Spain with limited access to email and phone. Italian Community Center, Fundraising is a TEAM SPORT for Executive Director, Boards and Fundraising Staff. Call Four in my new series, “Dial Down the Drama, Dial Up Your (Giving and Living) Success!” Topic: Bringing My Body Into It – How Do You Value Your Health? Tuesday: with Steve Engle on Making an Artful Ask!